Google has been pushing a new concept recently called Accelerated Mobile Pages, or AMP for short. This is the next initiative from Google to improve the search experience for mobile users on slow connections. Search statistics now show that the majority of users accessing the internet now do so on a mobile device, very often on a 2G or 3G connections. Hence, any speed improvement, no matter how minor, will be a boon to those users. What AMP does is deliver to those users a stripped down version of your web page with almost all design removed and only the bare bones content remaining. Mobile users on slower connections are automatically delivered your AMP pages, and user on faster connections will see your page with images / links / ads all in place. In short, AMP is a ‘function over form’ initiative from Google – much like it’s ‘mobile friendly’ snippet that allows users the chance to select a result which is formatted for the small screen, you can now choose a result based the fact that it is likely to load faster than a non AMP enabled page. 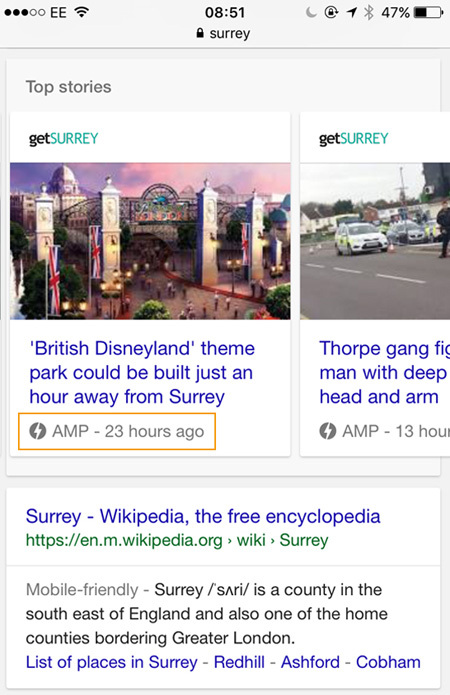 If you perform a search for a newsworthy topic on your mobile device (try Trump, Google etc) and look out for the green lightening bolt icon underneath a result – those are AMP results. Give them a tap whilst connected to a cellular network and see how the loading speed compares. So what does all this mean to marketeers or website owners? Well, as we all know by now, Google gives priority in its search results to faster websites. Websites that offer AMP pages are by definition faster, and therefore this is a great initiative to help you further improve your SEO. So if SEO is important to you in generating new business enquiries then AMP is something you need to be integrating into your digital plans. Get in touch today to find out how you can incorporate AMP pages into your website. Call Canvas Digital on 01372 227955.